Need a dessert recipe that’s one-bowl, no-mixer and out-of-this-world delicious? Grammy’s Easy Chocolate Yogurt Cake is all that, and more! When I opened two emails last week, within 24 hours, requesting a chocolate version of our beloved French Grandmother’s Lemon Yogurt Cake, I knew it was time to go into my mad scientist mode. I pulled out sugar, flour, cocoa, Greek yogurt, eggs, and oil. A few attempts later (and an incredibly wonderful smelling kitchen), Grammy’s Easy Chocolate Yogurt Cake had evolved. Who’s Grammy? That’s me! I never imagined when I posted the French Grandmother’s Lemon Yogurt Cake recipe several years ago that it would end up becoming one of the most popular recipes on the blog. Yes, I know it’s a crazy name. The original French name for the cake is Gâteaux de Mamie (translated: Granny Cake). The story’s told that grandmothers all over France have become renowned for making this simple, delicious lemon cake. When I read about the charming history that goes along with the recipe, I decided it deserved the fun name. I’ve gotten email comments from readers all over the world who love this super easy cake that can be thrown together in minutes. It’s a one-bowl, no mixer cake that’s simple, elegant, moist and flavorful, all at the same time. 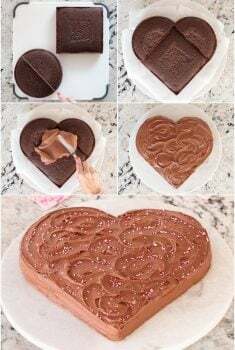 The chocolate version was a bit of a challenge because cocoa powder can cause baked goods to have a dry texture, if you add it to a recipe without making other modifications. I decided to decrease the amount of flour a bit and increase the yogurt to compensate for this problem. After a few tests, I think I got it just right; a delicious, moist, super chocolatey. One of the really nice things about the French Grandmother’s recipe is that there’s no icing to make or to have to spread on the cake. Just a super simple syrup glaze that gets brushed on while it’s still warm. 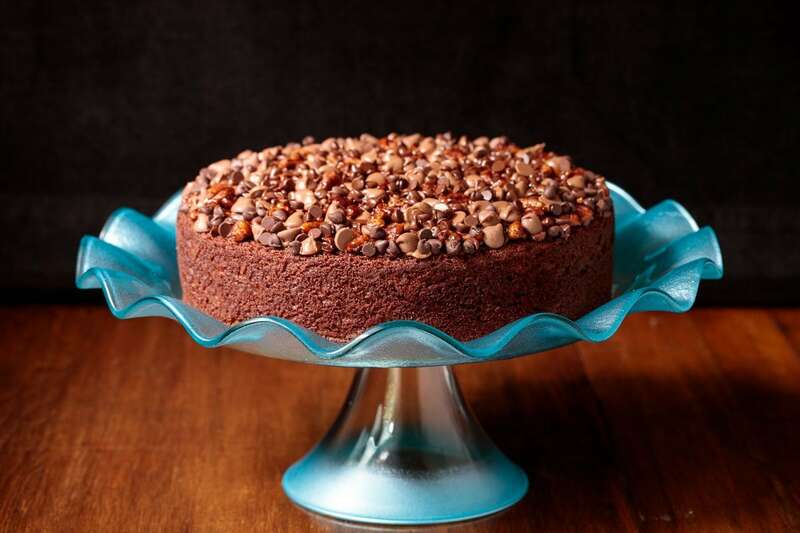 I wanted a similarly simple finish for my easy chocolate yogurt cake and decided on a chocolate chip-pecan topping that’s quick to put together. 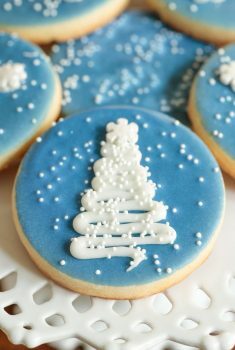 The topping turned out to be not only easy – but beautiful! How does it work? While the cake bakes, put together a batch of easy glazed pecans. Just combine butter, sugar and chopped pecans in a small saute pan and cook, stirring frequently, until golden and shiny. 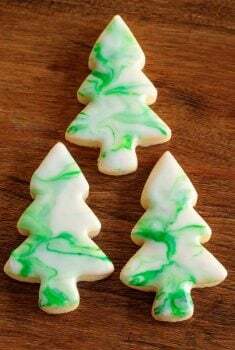 Turn onto a sheet of parchment paper and set aside. After the cake is cooled a bit, sprinkle the glazed pecans over the top. Let the cake cool just a bit more, then sprinkle liberally with chocolate chips (I like to use two sizes for a pretty presentation.) That’s it! Voila – a cake that looks like it came from a fine bakery!! Be sure to grease your cake pan well and to line it with parchment paper. You want the cake to slide out of the pan easily, without any sticking. I love these parchment paper circles. I store a stack of them right in my cake pans so I have them at my fingertips. They come in 8-inch and 9-inch sizes. Since this cake doesn’t require a mixer, it’s important to use the right tool for mixing it up. Use a whisk to mix up this cake. A whisk will help incorporate air into the batter making the cake lighter. It will also help eliminate lumps quickly, without over mixing. A decent whisk is inexpensive and will last for years. I use a whole milk Greek yogurt for this cake. Low-fat would also work. You can use your preference of chocolate chips for the topping. I like to use mini and regular size chips. The mini chips I use are semi-sweet and milk chocolate regular size chips. The two different chocolate chips are not only delicious but make for a super pretty presentation. Be sure to wait the 15 minutes before adding the pecans and chocolate chips. Otherwise, the cake will be too warm and the chips will melt into little puddles. Still tasty, but not nearly as attractive! This was always the very first thing that French kids learned to bake because it was so… easy. This easy chocolate yogurt cake would also be perfect for kids as it’s just as simple. So there you have it, these yogurt cakes are perfect for young and old alike – both for making and enjoying! Need a dessert recipe that's one-bowl, no-mixer and out-of-this-world delicious? 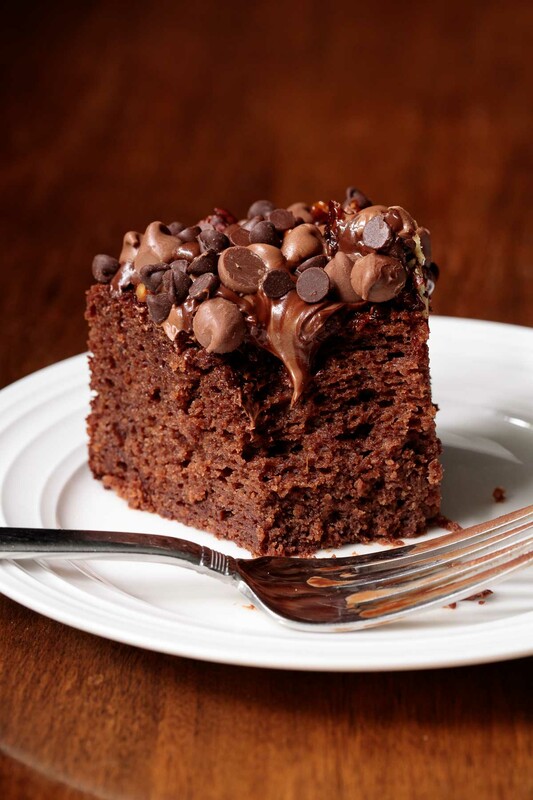 Grammy's Easy Chocolate Yogurt Cake is all that and more! Preheat oven to 350˚F. Spray an 8-inch cake pan with baking spray and line with parchment paper. Set aside. In a medium-large bowl, whisk together flour, cocoa powder, baking powder, salt and sugar until completely combined. Make a well in the center and add yogurt, eggs, oil and vanilla. Whisk well until all ingredients are incorporated and batter is smooth. Pour into the prepared pan and bake for 35-45 minutes or until a toothpick inserted in the center comes out clean. Cool in pan for 15 minutes then turn out onto a plate or serving platter (flat bottom of the cake will be facing upwards. Top with glazed pecans in an even layer. 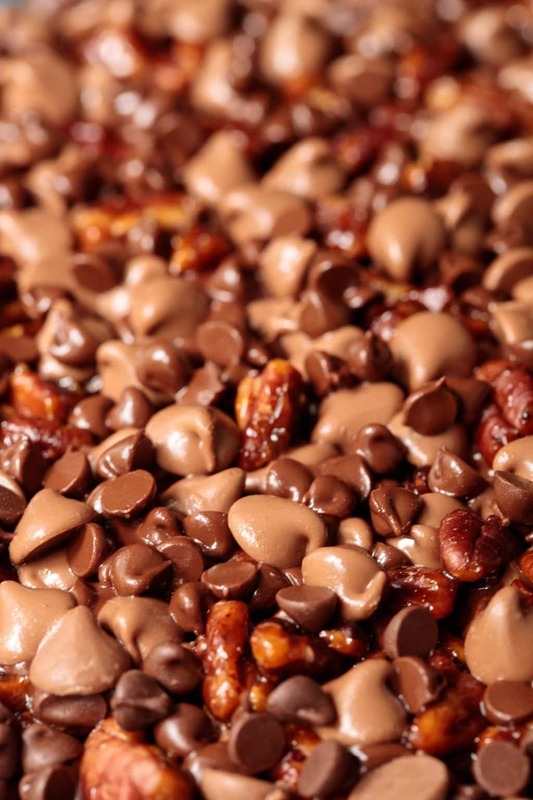 Scatter chocolate chips over the top between the pecans. Allow to cool before cutting and serving (if you can). While the cake is baking make the glazed pecans. Place a piece of parchment paper or greased foil on a work surface. Combine butter, sugar and pecans in a medium size non-stick pan. Cook for 4-6 minutes over medium heat, stirring frequently until sugar has melted and pecans are golden brown and shiny. 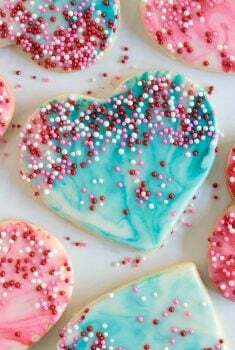 Turn out onto prepared parchment paper or foil and spread apart with a fork. Allow to cool while cake finishes baking. See Café Tips above for further instructions and tips. I made this with homemade coconut yogurt and it was rich and delicious! For the oil I used a combination of olive oil, macadamia oil and coconut oil. It took an additional fifteen minutes to cook but in a fairly old oven. Wow, that combination of oils sounds wonderful! Thanks for sharing your results, CD! I really want to make thi,s but I am still waiting for a reply to my question below! I notice in the text it mentions a super simple syrup that gets brushed on while the cake is warm. Where are the ingredients and directions for that? Thanks! When I referred to a glaze, I was talking about the syrupy glaze on the French Grandmother’s Lemon Yogurt Cake. 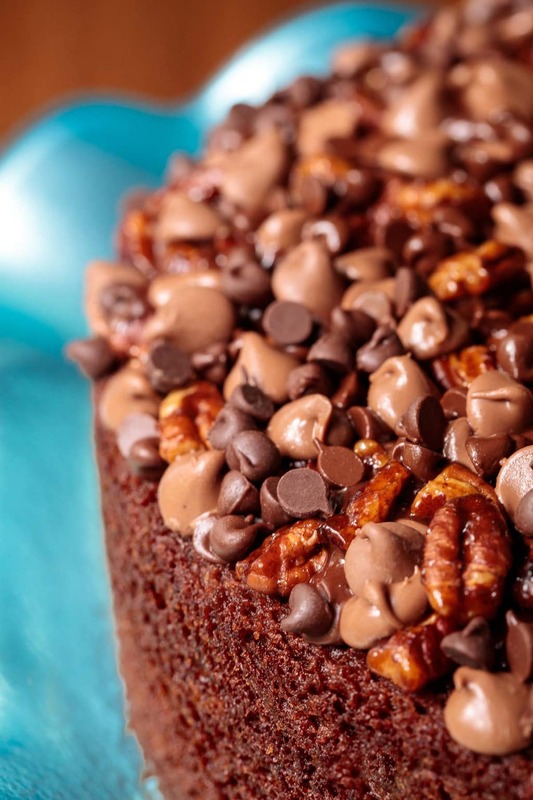 I decided to replace the glaze with the chocolate chip and pecans on this cake. 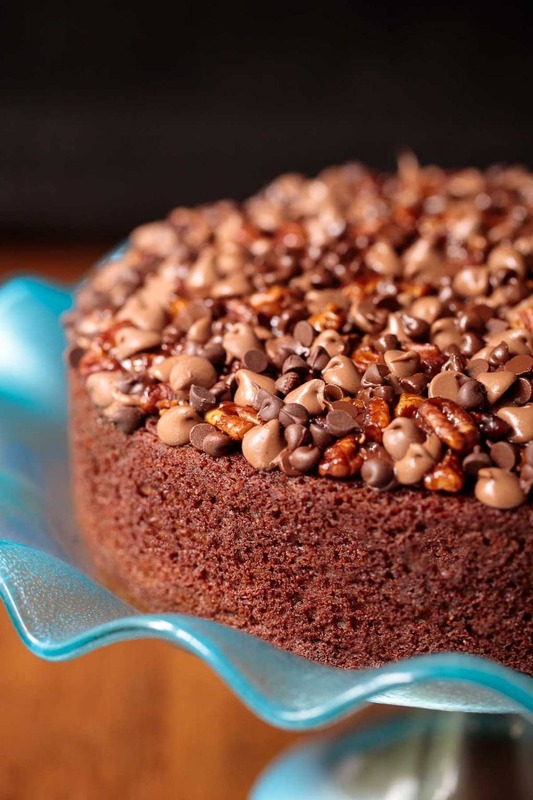 So there’s no glaze to worry about with this cake, just the yummy chocolate chip/pecan topping. Enjoy! hi. 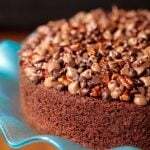 i would love to try this easy chocolate cake but i only have 9 inch pans. I’m guessing the time in the oven should be less? Hi Sam, yes a little less time for a 9-inch pan. I would set my timer for 25 minutes and check it at that point. If it’s not done, check every few minutes until the center is firm when touched lightly or a toothpick inserted in the center comes out clean. Would non fat Greek yogurt work? Beautiful presentation indeed! You can never have too many chocolate cake recipes and this one is a keeper. The challenge would be resisting the urge to nibble on the topping. Can I bake this as a cupcake? For Father’s Day, knowing I had a lemon lover and a not so lemon lover, I made both of the Grandmother’s cakes. The lemon, as usual, was wonderful, the chocolate was a delight. I found it to be the texture and crumb of a cake, something in the flavour evokes brownies for me, perhaps the cocoa powder? Very much in a good way! I found it to be lovely and not too to chocolaty. The topping was yummy, waiting 15 minutes the cake is still warm so the chips soften and meld with the nuts. The next day, (somehow we did have leftovers), being not a chocolate chunk person (don’t want them in my brownies etc.) I did not love the chocolate chips as much as when warm, though if I’d had Chris’s suggested mini-chips, that would have worked better when cooled, but I adored the nuts, that little subtle candied nut is ideal with this mellow chocolate cake. I may play around next time and add some toasted coconut, too. Thanks so much for sharing your results, Coleen. So thoughtful of you to make both cakes! It does sound “just right” and very delicious. Thanks, Chris, for this great dessert. I made it Saturday night for Sunday dinner. I had all the ingredients on hand except milk chocolate chips, but I did have butterscotch chips. So that is what I used and in the future I will continue to use the butterscotch chips. They were a perfect complement to the glaze pecans. The family – all ten of us – gave it rave reviews. When my daughters and daughter-in-law first saw the cake they thought I had purchased it from a bakery. It was beautiful (and so easy)! All the ladies in the family are Cafe devotees! Thank you for adding fun, joy, and great food to our families! Thanks so much Cathy! I appreciate you taking the time to leave this great review. And I LOVE the idea of butterscotch chips, yum! Great idea! I am absolutely powerless from this gorgeous cake Chris! The texture looks fantastic and that topping – oh yes please! Outstanding 🙂 Sharing and pinning! This sounds wonderful! The grandkids are coming in a couple of weeks and wanted to cook so I had just pulled out your lemon yogurt cake recipe. This will definitely have to be tried first. Another winner Chris! Hi Pam! They will love this cake. My grandkids gave it the “blog worthy” award! Hope you’re doing well! We do need to schedule a get together! My two favorites desserts are chocolate and lemon so I’d love either….but I do sway a little more toward chocolate 🙂 This sounds so good, Chris! I’m sorry, I missed just how many chocolate chips – maybe 1/2 cup each? 3/4? Thanks so much, I added the amount to the recipe! Your photos and description of this cake are making me drool Chris! I want to grab that fork right off that plate and dig in! Delicious work my friend! Thank you for this lovely recipe. I have two questions. Can it be made in a loaf pan and can the nuts be eliminated from the topping? Yes, this cake could defintely be made in a loaf pan. The baking time will be a little longer, I’m guessing probably 45-50 minutes. And yes, you could make it without the nuts. You could use just chocolate chips or brush it with a simple syrup instead of the topping. My husband will love this cake.You are so good at inventing recipes.I am a copy cat..grateful to have people that I can copy..people that teach me.Thank you. wow…that topping looks incredible and the crumb is perfect!